Skyberries Handmade: Strawberry Block Tutorial - Stem Update! Strawberry Block Tutorial - Stem Update! At last! 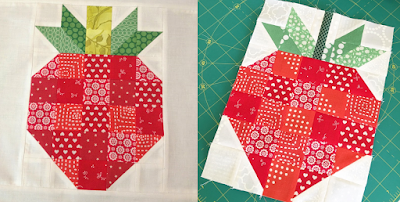 Here is the promised stem update for my ever popular strawberry block. I've had the step-by-step photos on my computer for 18 months! It's definitely time they were put to use. Here are the two blocks side by side. The left is the original. The stem seemed a little thick and clunky so I modified it to create the thinner stem on the right. This new stem DOES take longer to make but I like the effect. Please note: this is an add on to the original tutorial. You will need to reference that tutorial for most of the cutting and sewing directions. This stem modification replaces the two 2" squares in print C as noted in the cutting directions of the original tutorial. This is what your pieces will look like when you've cut them! Take the two white pieces and mark a point one inch away from the end using a removable marker. Make sure to mark the opposite side of each piece. You should end up with two pieces that look like this. Using a removable marker and ruler, draw a straight line between the dot and the closest diagonally opposite corner. You are essentially marking a half-square triangle on the corner of the piece. When you have marked the line on both pieces they should look like this. Notice they are opposite! Place the white pieces and green pieces at right angles with the marked corner of the white overlapping the green. Sew and trim the corner to a quarter inch. Press the seams (I pressed mine open) and you will have your two inner leaf pieces! Using all the green half-square triangles (HST) and two white 2" squares as shown in the original tutorial, arrange your pieces as shown. Make sure you have the HST arranged so that they match the fabrics used for the inner leaf pieces. Sew the piece together in three sections: the right side leaves, the stem and inner leaves and the left side leaves. You will have three pieces as shown. 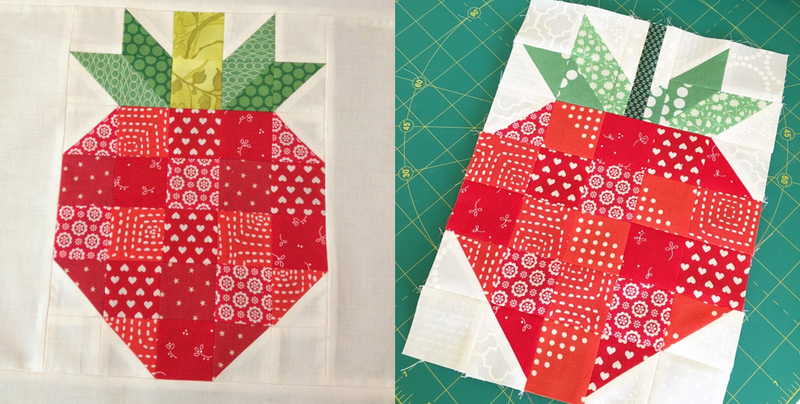 Sew the three sections together to finish your strawberry top! Sew the body of the strawberry as shown in the original tutorial and attach to the strawberry top to complete your strawberry! I know there are a few people who have been looking out for this stem update. Thank you for your patience. I hope you enjoy it! Feel free to ask any questions in the comments below so the answers can be helpful to others with the same question. And if you spot any errors let me know so I can fix them right away! Enjoy!